I don’t mind slow weaving. The progress that is measured in hours, not minutes, is satisfying. I don’t mind fast weaving, either. It’s a chance to be productive. These mug rugs fall in the fast-weaving category. I can whip up a few of these in an afternoon. Plain weave hems fill the space between rep weave mug rugs. 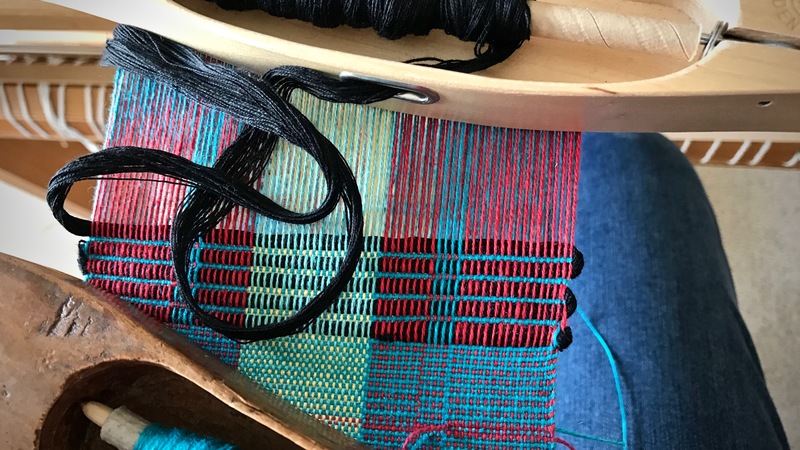 I hope to get 20 to 25 of these little mug rugs from this six-yard warp. 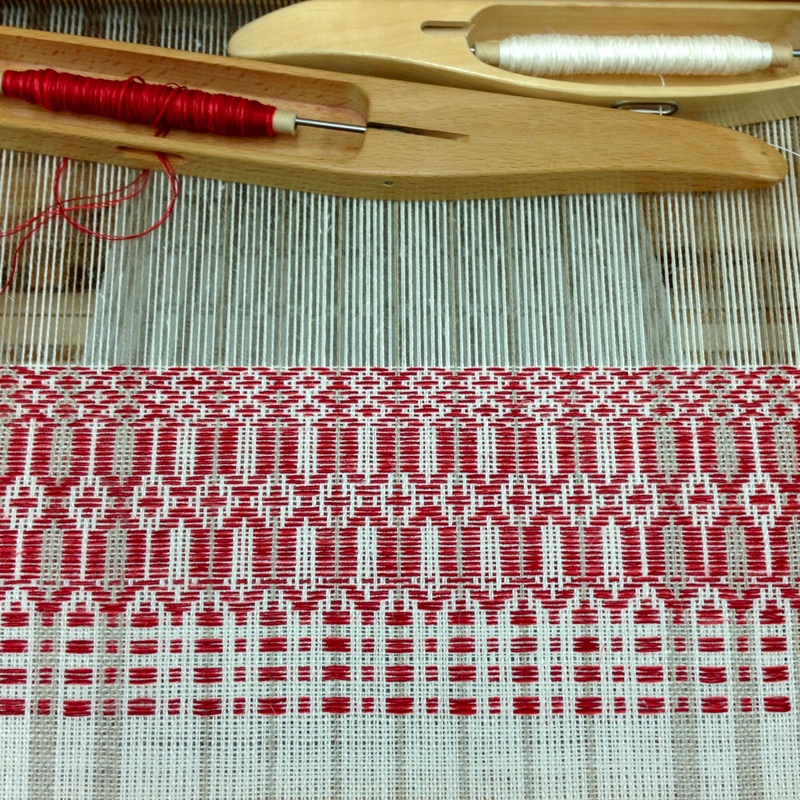 I have to admit, it’s fun to weave something easy once in a while. Now, I can measure progress in minutes, instead of hours. We determine the value of things according to time and effort, don’t we? How long did it take, and how much effort? Some woven items are destined for elegance, and others are, simply, rugs under mugs. 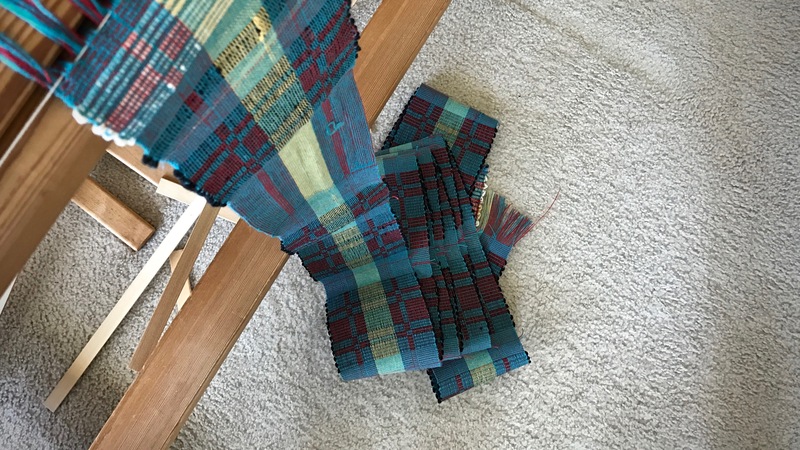 Mug rugs begin to circle the cloth beam. Turquoise Cottolin weft thread alternates with black midi stringyarn. 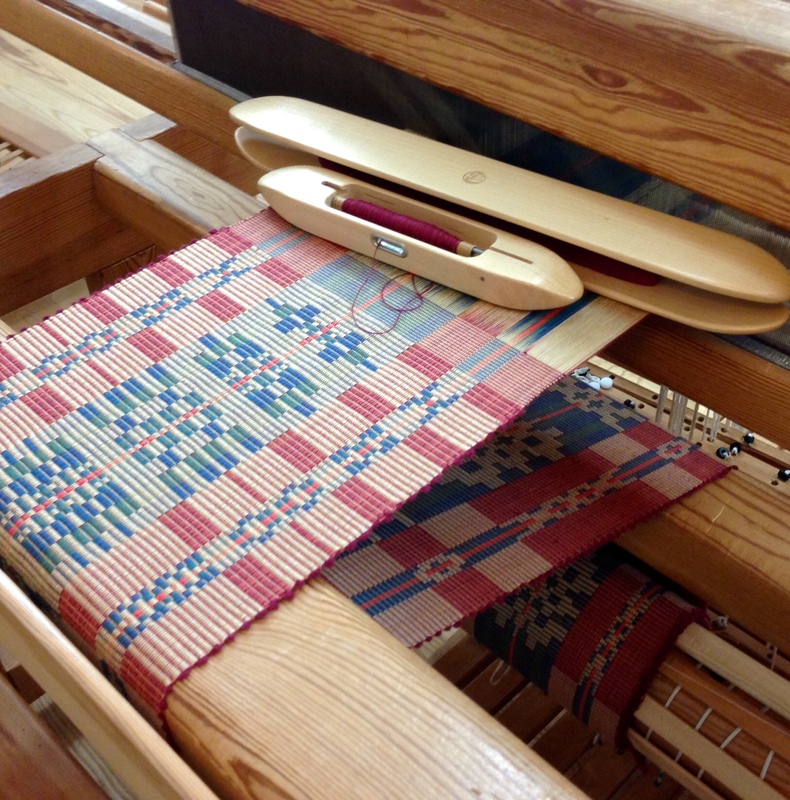 Block changes are made by weaving two thick picks in a row. Grace doesn’t measure value that way. The Lord’s generous grace demonstrates true equality and fairness. His grace places equal value on people, not taking into account how “good” they are, or how much effort they extend to do “good” things. Grace is distributed equally. The Lord offers it to all, not because of who we are or what we have done, but because of who he is, and what he has done. That’s good news. The mug rugs may end up on an elegant table, after all. May you receive and extend grace. PS Plattväv Towel Kit update: Still in progress! You will be the first to know when the kits are ready. 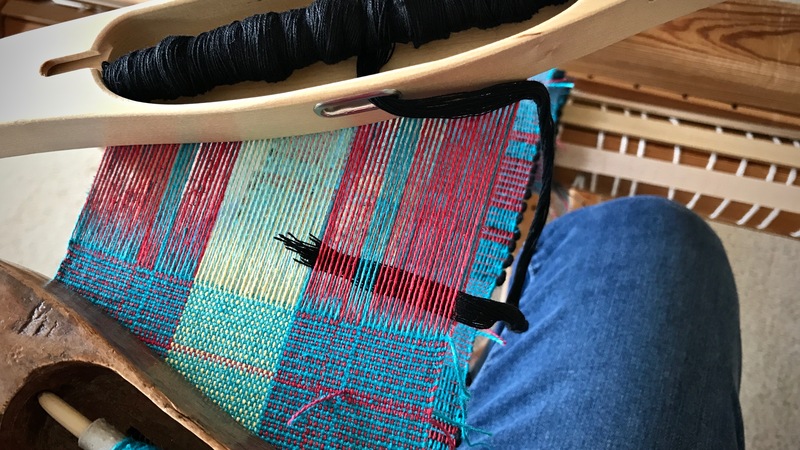 Put on a new warp as soon as possible. That’s my philosophy. 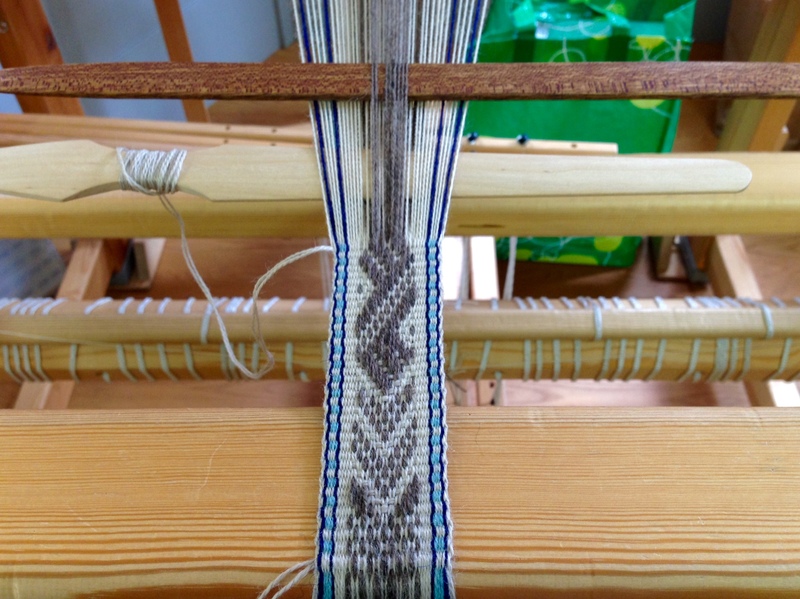 A weaving loom should not stay bare. 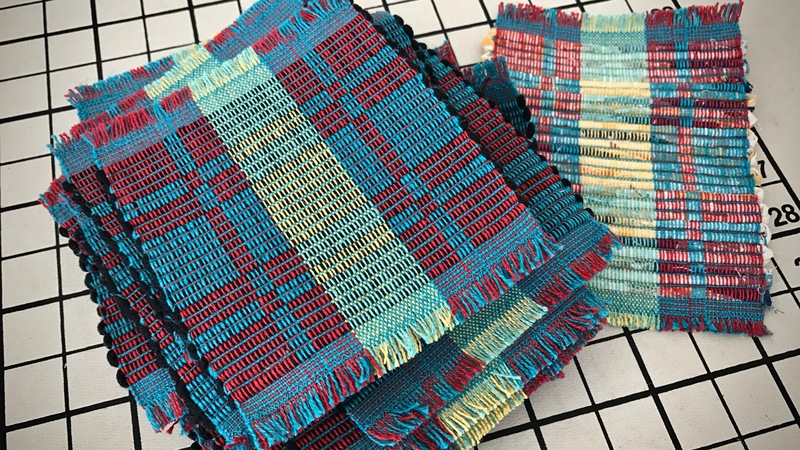 I am ready to begin a stack of rep weave mug rugs (my local weaving group is making them for an upcoming conference). Cottolin warp seems to light up on the warping reel. The colors become more vibrant when lined up together. 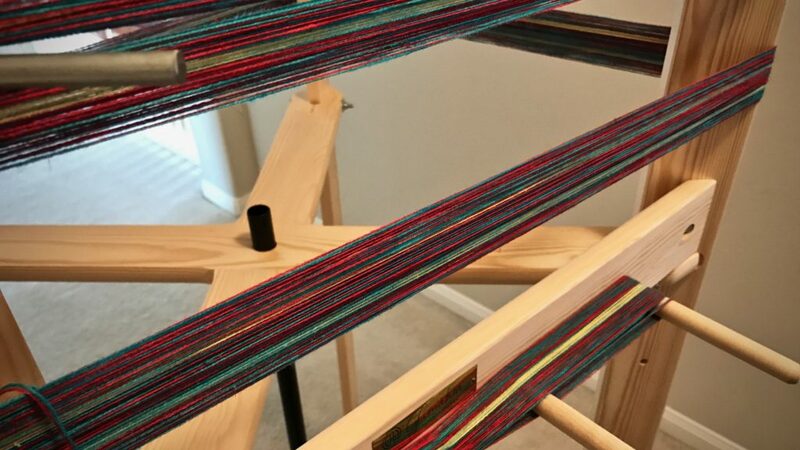 A new warp comes alive as I wind the threads on the warping reel. It is a picture of possibility! Every warp has a beginning and an end. 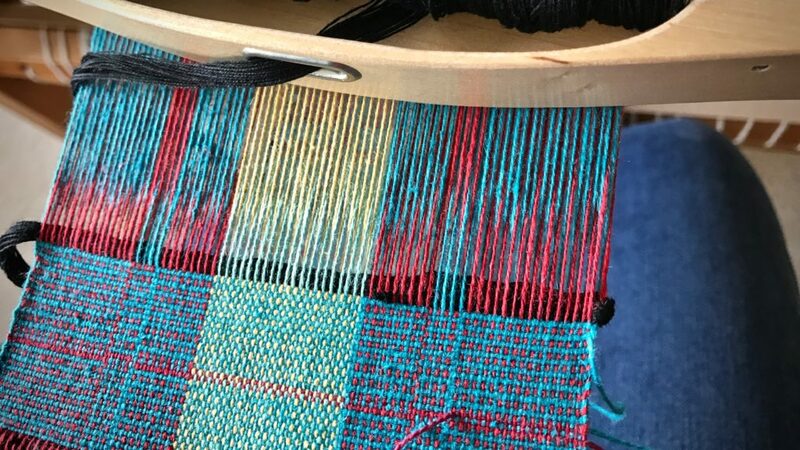 Beginning a new warp on the loom is always exciting. 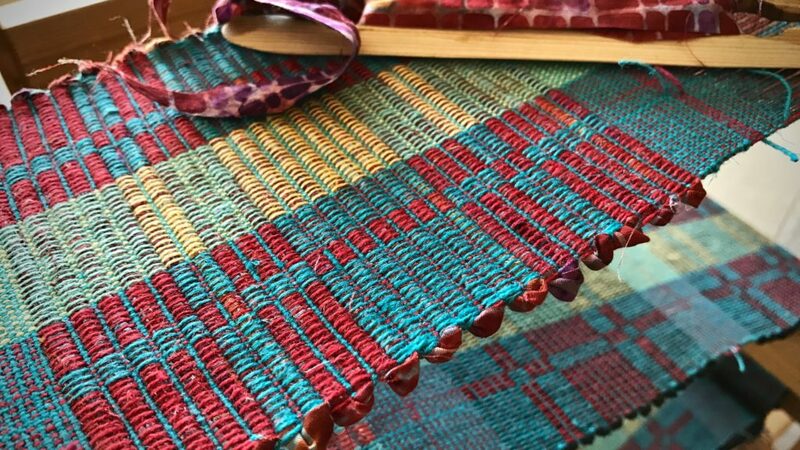 And when I come near the end, I often wish I could weave a little longer. Warp chain is ready for dressing the Glimåkra Ideal loom. Lease sticks are in place under the reed, held up by two support sticks, and the warp has been pre-sleyed. Next step is to set up the warping trapeze. Have you considered the warp as a metaphor for a life’s span? It is measured out in advance, with a certain type of fabric in mind. The setts, patterns, and structures vary. But they are all meant to be woven. Weft passes are like days and years. For a time, it seems like it will never end. And then, you see the tie-on bar coming over the back beam. You’re reminded that this warp is temporary. We all have this in common: We are mortal. Time is a precious gift. 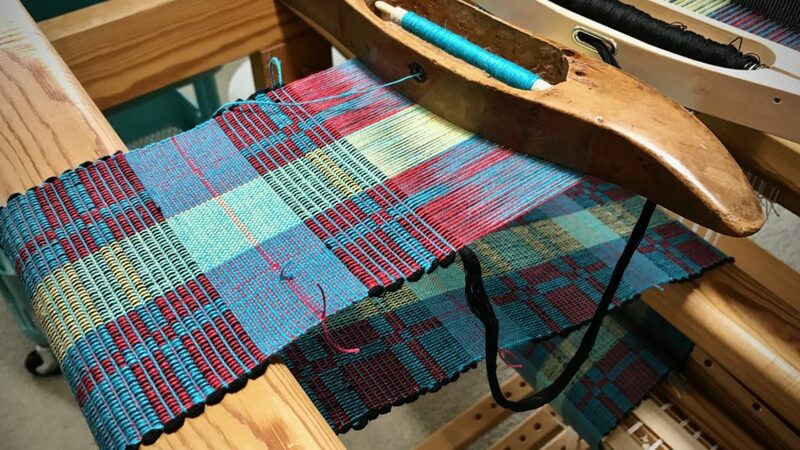 Every pass of the weft is a reminder of our Grand Weaver’s loving attentiveness to complete the weaving he began. May you enjoy the gift of time. 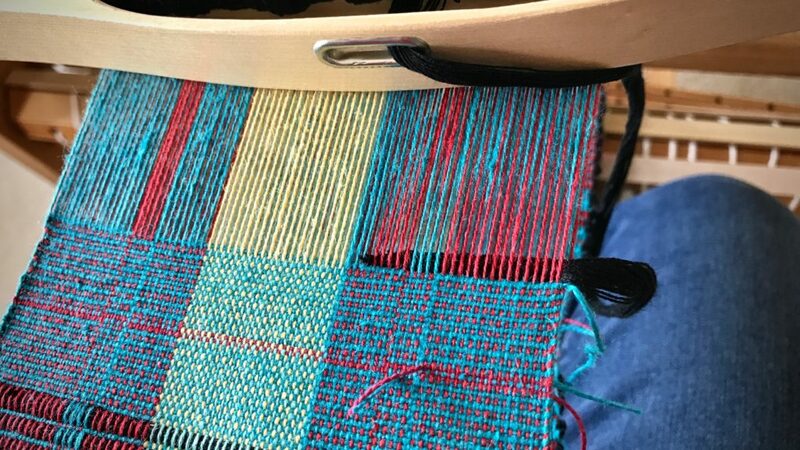 Love the image of being a weaving in progress. 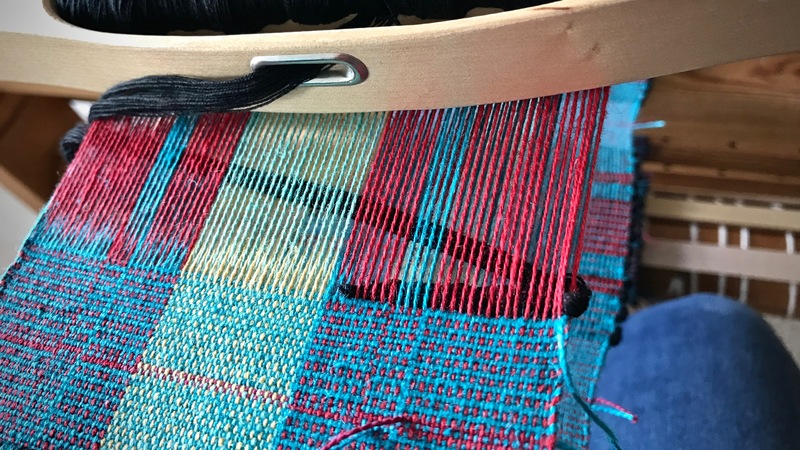 As weavers, we take such care to bring projects along…we spend extra and loving energy sorting out the snarled sections. Most importantly, we are persistently present. How delightful it will be to sit at my loom tonight and reflect on my life as a weaving in perfect confidence that my Creator always has the shuttle. What a lovely way to say it! In that confidence lies true rest and peace. I hope those mug rugs are going to the CHT conference ! I’ll be there – hope to see you. Hi Kate, You guessed it! That’s exactly where they are going. It would be great to see you! 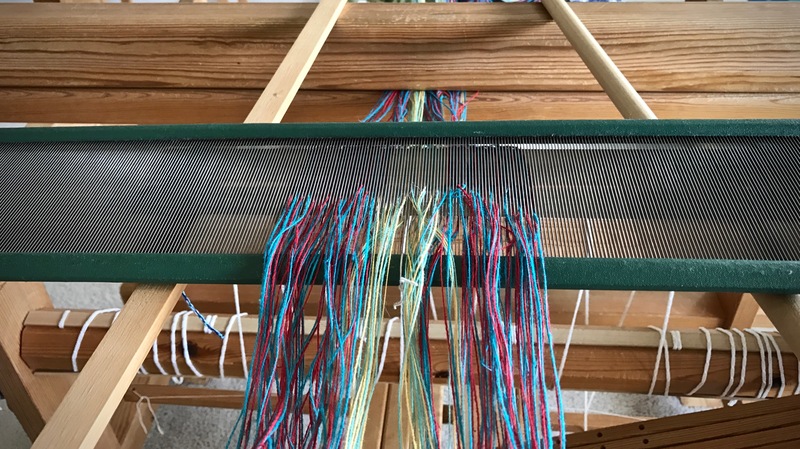 I’m a weaver in Michigan, new to your site. I am loving your posts! Thank you for your reminders of how all things can be seen through the eyes of our faith, and our lives made richer because we do. And we learn so much from our Lord! I also strive to always have something on each of my looms. Right now that is a rayon scarf in peacock colors on my 8 shaft Schacht Standard, a baby blanket in James C Brett Marble chunky on my 48 inch Ashford rigid heddle loom, and placemats on my 15 inch Cricket travel loom. My 30 inch Flip loom just became bare after finishing another smaller baby blanket in soft washable acrylics. 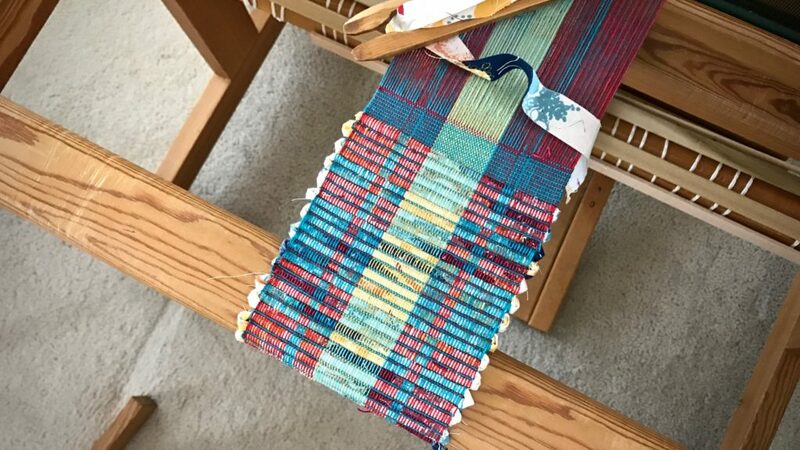 Aren’t we blessed to be able to weave this life and give of our weaving skills to others?! Thanks in advance for the blessing of your thoughts as you continue to post them. Hi Cindy, Looms all active! What a treat to hear about what you have on your looms. Who would’ve thought we could gain and give so much by weaving fabric? 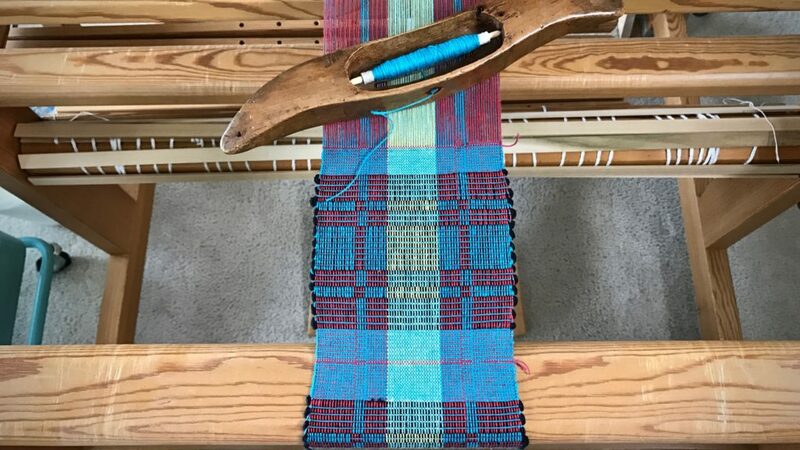 Beautiful…both the weaving and the analogy! God bless! Hi Debi, Ah, how kind of you to stop and leave your thoughts! Hi Bruce, We all need comforting thoughts. I’m glad you found some of that here! I’m always drawn to photos of rolls of yarn, thread, and wool. There is something about the colors and chaotic tangles that give beautiful patterns making for great composition. Also there is a nice representation of something in transition… taken something raw from nature and turning it into a transitional product full of possibilities. 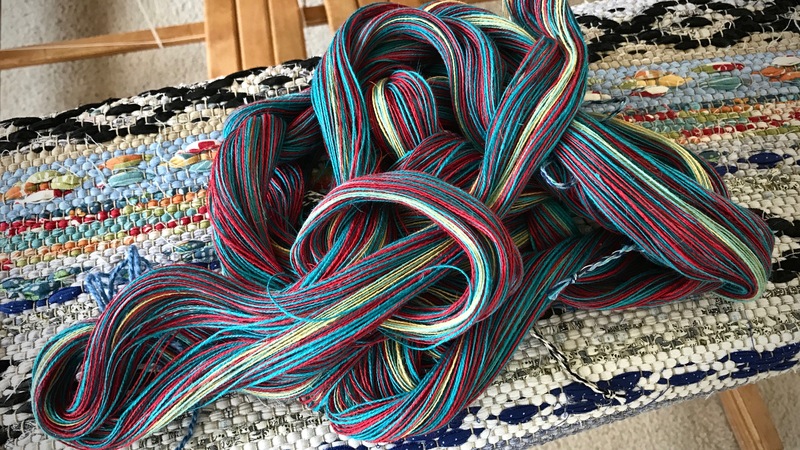 The colors of this warp chain are beautiful together. Hi Missie, I agree, a collection of (somewhat organized) yarn or thread is a good representation of transition… with all the uncertainty and unknown, yet it holds a promise of something good or useful that will come out of it. Great thoughts!